Curiously, I’m involved in two very different relationship triangles. The first is a challenging learning experience. The second is life-giving. 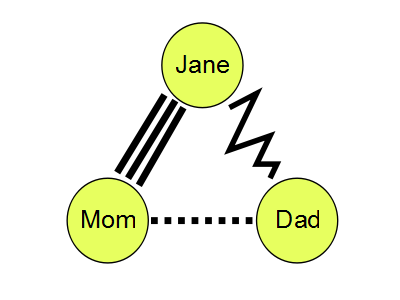 Years ago I learned about relationship triangles via family systems theory. Since then, I have striven to maintain strong one-to-one relationships as well as to avoid participating in unhealthy third person situations. 1. Don’t talk negatively about a third person in the triangle. 2. If you are going to vent or complain about someone, do it to an unrelated third party. 3. Don’t pass information between people. 4. If you are on the outside edge of a triangle, focus on improving individual relationships. Phew, I did all of the above. Yet, while I’m thick-skinned, this stuff leaves me feeling knocked around. I wonder, should I give the benefit of the doubt to someone new at my blog? Should I defend a returning member’s point? Should I choose a side or mediate? Should I ignore the situation or stay out of it? With people I know well, I support both, telling each that I trust they can work things out. In more distant relationships, I look for personality clashes and tend to see the good in each person. But sometimes, conflict isn’t about personality, it’s about right and wrong. My turf (social media and IRL) is a safe place to engage in meaningful content and discussion while also practicing respect and kindness. When I visit your blog, I will never treat anyone there disrespectfully. Never. For now, if I find myself in a similar comment triangle on my turf I’ll link to this post which explains my newbie dilemma. And I’ll quickly get back to writing about family life. Which gets me back to my daughter, son-in-law, and me as we wait for their baby to be born. We’re so happy. And as soon as baby is born, the couple will become a family of three, a most beautiful and pure example of the power and joy of a life-giving relationship triangle. Do family relationship triangles challenge you? How do you stay healthy when drawn into an unhealthy triangle? How do you help all family members to have healthy one-to-one relationships? This entry was posted in Challenges, Community, Lifestyle, Performance, Purpose, Relationships, Social Media and tagged Articles, Blog, Family Systems Theory. Bookmark the permalink. I personally thought it was a rather tame “conflict” and all in all you didn’t lose anything since that was the only post they had commented on anyways on your website. For me it is a bit harder, especially on my website. I try to ignore comments on other people’s blogs and do 99% of the time. The 1% I don’t is when it is on my reblog, which was the case here. Then it becomes a little tricky because I see the comments since I actually visit each reblog (or try to) and link to it. I do that as a courtesy and a return back favor for the reblog. Anways, I agree with your article and Don and I have talked on this topic a lot privately. It is something us powerbloggers get and we learn to shrug it off. But… sometimes it still bothers us. We are human after all and I consider myself a “blogger” just like everyone else. Thanks again for the mention as always. Thank you for commenting, Jason. And I agree, this was a tame conflict, likely only striking to me because it was the first at my blog! What I can say objectively is that you have been only a friend to me. You have generously shared your time, talent, space, and experience with me. Same with Don. You are! So let the cook off begin 🙂 YUM! But didn’t someone say fore-warned is fore-armed ? You are right, Don. At some point, a line gets crossed, the truth must be told, and a friend must be supported. As Aristotle is quoted to have said, “A friend to all is a friend to none” so it is never my intention to use kindness, or charisma :), as a way to avoid tough situations or decisions. Thanks again for the fore-warning and for sharing how you have chosen to handle such situations. And thanks for the feedback that you feel my positive vibe 🙂 Double cheers! Family life is challenging , always, I am not sure I am able to solve the problems appearing ( triangle or rectangle 🙂 ) but I do my best . I think it is important to keep talking with good arguments , this is what I have learned. Arguments are very important , one has to know for he stands for and why. Personally I have treated my children always like adults concerning conversations, they have to know how to defend themselves and why. Up to now I think they are doing well, if one looks around what’s going on in society. Hopefully they have developed strong roots, to withstand the tide! Exactly. We need to articulate our values to our children in a way that makes sense to them at different stages of their lives and in a way that they can articulate to others. As a parent, I like the challenge of making persuasive arguments as well as listening to why others disagree, including my children. It keeps me humble and honest 🙂 I’ll think on this more and hope to turn the topic into a post here. Thanks always, Evi! Look it is normal and human that we can’t agree to everything, otherwise our life would be very boring. It is important to keep the wheels turning! Hi there Angie, I hope you are doing well..
Aquileana! I’m chuckling to myself because your interpretation of this title didn’t cross my mind, lol. I was hyper-focused on applying what I know about family systems theory to blogging, but your point is well made. I will pay closer attention to my titles as not to mislead 🙂 And I’m truly glad that you find my approach original. Thanks for being for real, Angie! I really liked this post, a lot of food for thought! Thank you, Diana, for describing me as “real” as compared with “full of failings” or “why hasn’t she figured this stuff out already?” LOL! And I love being “real” with you, friend. Really, thank *you*. Oh Kate, you bring up a very important point, one that deserves it’s own post (thank you for the inspiration.) You are right. One of the most challenging positions to be in (or should we say out of) is the one standing on the outside of an unhealthy triangle, looking in. I feel strongly that it is a parent’s responsibility to not allow such triangles to happen among their children. My husband and I come from an era and a hometown where favoritism among siblings was very common. One sibling was labeled “the good kid”, another was labeled “the trouble-maker”, another was “the handsome one” or “the smart one,” etc. My husband and I really wanted to not hand this mindset down to our children. The truth is, all children are good, trouble, handsome, smart, etc. Each child has something special to give to the extended family. You are right again in that talking doesn’t usually work in the case you describe. What can help, but only if there is some type of reciprocity, is focusing on the one-to-one relationships while letting go of the triangle and wishing them well. Comments can be so hard to finagle sometimes. I’ve had lots of what I call “drive by hate” on a post on my old blog, and I was once “attacked” on a political blog because I expressed my personal dislike of a popular band. The guy said he wished he knew were I lived so he could call CPS and have my kids taken away. Over a band! That’s been disbanded for decades! He was one of those commentors that I always refused to engage with because he seemed a bit high strung. It was after that, that my blog friend banned him from commenting anymore. We need the blog version of those balancing sticks the tightrope walkers use, lol. I am always the go-between. Always. I do think it’s the only time I have diplomacy. Oh no, I get it.